Auroville in march bakes in the heat. Colours feel magnified on the Tamil Nadu coast, three hours south of Chennai: Red dirt hangs in the air with the passage of motorbikes, coating green leaves parched with thirst. There is a clarity of blue sky that I almost forget exists while I’m in the city. Around me, sweat-drenched faces hail from every corner of the earth. Complexions equalise in the sunlight, all of us baked to brown and red. I leave the multi-national village of Auroville each year with a little more Tamil, French and Italian in my head, and the knowledge that I have still not understood this place. Auroville eludes me, but not as much as the thing I’m chasing there. I have come to learn Argentine tango, along with a growing crowd that converges here annually from all over India and the world. Five years of tango in Bangalore and Auroville, and still I am addicted to the dance; still I’ve barely learnt anything at all. I am left with the feeling of standing with my head upraised, having reached the foothills of something beautiful. Tonight, March 11, 2015, is the start of the four-day Auroville Holi Tango Festival, now in its fourth year. I am watching a young woman with a feather in her hair. She springs up and down the side of a building through metal bars that appear unreachable to me; in her hands, the bars become a ladder. The woman is hanging floodlights; occasionally I pass her electric cables. The sun is beginning to set, and in the coolness of that half-light, the building becomes a tree and this girl a wood nymph. I cannot place her features; her accent has the French-Indian softness of everyone who has lived in Auroville for long. She tests the lights, adjusts the intensity of red and orange on the open-air floor to illuminate dancers to the best effect. Two designers arrive to set up speakers, and the mournful sound of an Argentinian bandoneon (a type of concertina) fills the quiet air of dusk. A cracked voice sings in Spanish, separated from us by oceans and decades. I only catch the occasional word, but emotion still carries through. Yearning for something lost, for a thing beyond words that the singer still searches for. Dance translates through movement what the mind is not large enough to carry. The type that gets attracted to Argentine tango is hard to pinpoint. In India, tango dancers necessarily belong to an economic stratum of society that can afford classes, which vary from Rs 150 to several thousand rupees depending on the teacher. Beyond that, what dancers do as their day jobs ranges from sculpting to ecology to programming to design. But there is a commonality between those that stick with the dance through the years: Scratch the surface, and each is a little bit restless with his/her daily pursuits. Each is creative, and searching for a thing in life that exists beyond words—a half-imagined beauty, perhaps; a global aesthetic that tango seems to contain. Tango has had pockets of interest across India for more than a decade, but its current growth in terms of classes, socials and the sheer number of attendees in Bangalore and Mumbai is a product of the last half decade. Partly, this surge of interest can be attributed to tango instructors from Europe and the Americas who visit India regularly. In other cases, instructors have started living (at least part-time) in India. In Mumbai, there’s Malou Meyenhofer (a professional dancer originally from Switzerland) and Nicolas Sandez (an Argentinean dancer and trapeze artiste). Hubert Tassin, a French designer who discovered the dance in Turin, Italy, holds classes in Bangalore, while Jorge Ayarza (an engineer of Ecuadorian origin) and Aurevan Lung (a French-Indian teacher from Auroville) take classes in the village and help organise the annual tango festival. Ask tango dancers why they dance, and words begin to fail. Tango is an obsession. Tango is like love. Tango finds us, we don’t find it. At the Auroville Holi Tango Festival, I collected thoughts from dancers who had gathered from across the country. “It’s a feeling that once you get hooked onto, you just can’t go away from it,” says 29-year-old Kruti, who has been dancing Argentine tango since it began to grow in popularity in Mumbai three years ago. Likewise for 32-year-old Debrup Sanyal, who started out when a trickle of interest in Argentine tango began five years ago in Bangalore, and continued to dance after recently shifting to Mumbai. “I just can’t find any other dance form as appealing or addictive,” says Sanyal, an automative designer. “Tango came at a time when I needed it the most,” says Roopa Math, a 32-year-old programmer from Bangalore who has been learning the dance for three years. Tango involves two people, one who leads the movements (typically male) and another who ‘follows’ (typically female). In that way, it resembles other ballroom dances such as the waltz or salsa. What sets Argentine tango apart is that the prescribed steps are very simple: One can walk, or one can pivot. Complexity grows only with the music, and the minds of the dancers. The focus in Argentine tango (unlike the more cinematic American tango) is not on style, but rather on the connection and “embrace” between two dancers, non-verbal communication of intention and emotion between partners who may be strangers. By listening to subtleties of touch and movement, each dancer acts as a conduit for his or her own and the other’s interpretation of the music. Tango is cerebral only to a point. It takes focus to learn technique in the beginning, but too much thought can tangle the tongue. After a while you have to let the body take over. 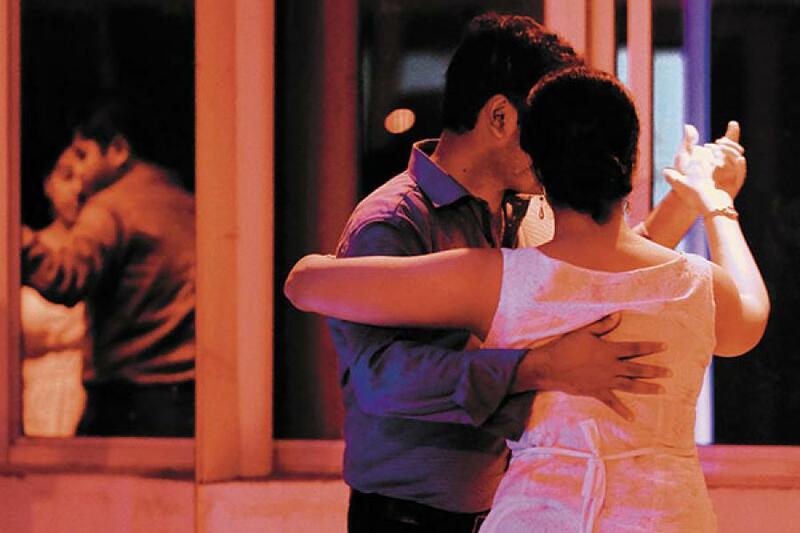 “The mind switches off and motor and music and other senses come into play,” says Kavya Murthy, 28, a sociologist who learns tango in Bangalore. If that sounds difficult, add the challenge of not bumping into other couples on a crowded dance floor and the dangers of being kicked by razor-sharp stilettos (or the pain of wearing them, for a follower), and you’re half way to the experience of a tango social. Once people are seduced by tango, however, I have never seen another dance that inspires so many words of adulation, or so much philosophising. Metaphors build upon metaphors as dancers seek words to express the wordless. Inglese and Trozzola were introduced to tango at a now-vanished cafe in Turin, which was also the place where they met. “One day, going down the stairs to [the cafe], there was a round window where you could see the legs that would move in tango,” says Trozzola. Drawn by this spectacle, he began to learn. “I understood that this was something more than just a dance. Over time, it became a passion, a means through which I could express myself,” he says. Inglese maintains that even before she found tango, the dance was waiting for her. “It’s strange, but it’s as if tango had already been there. It was natural to meet it.” Math describes her journey in similar ways. Although she found it by chance, Math feels that tango was waiting for her. For many years she was unaware that the dance was being taught right next to her home. “I had searched so many dance forms. [Tango] was just next to my house.” A friend took her for lessons one day, and Math discovered that the dance relieved anxieties. “The first time [I danced], my body relaxed completely. I said, ‘This is something different. There is something else here’.” She was familiar with other Latin dances, and still dances salsa, but tango filled a different need. Many add a spiritual component to the dance. “Tango is like meditation for two,” says 31-year-old Marianna Koutandou, who was invited from Greece to teach at the Auroville Holi Tango Festival with 32-year-old Vaggelis Hatzopoulos, also a professional tango dancer and teacher from Greece. “When you dance tango, and you communicate very well, you are able to feel the feelings of the other person. You are able to feel the breathing, the heart of the other person,” adds Vaggelis. That meditative connection has a lasting effect. “I know that even if I’ve had a bad day, if I just can find three minutes of genuine connection with another human (being), I will feel better,” says Shreekant Deodhar, 28, an ecologist in Bangalore, who has also taught tango at the city’s Indian Institute of Science. Some take that connection and let it feed the rest of their life. “[Tango] helps me work on some aspects of myself such as care, concern, respect and empathy,” says 30-year-old Joy Merwin Monteiro, an atmospheric scientist in Bangalore. Like meditation, the dance only grows as you learn it. “Tango is beautiful because it is infinite,” says Trozzola. “It never finishes. It’s like a horizon that’s always there.” And there are no tango experts, say Trozzola and Inglese. Argentine tango dates back to the mid to late 19th century. Its history is fraught, rising from decades of large-scale human displacement. The dance and its accompanying music borrow from rhythms and improvisational styles, such as the candombe (still popular in Uruguay) and milonga (an Afro-Caribbean dance), brought to the Americas by African slaves and sailors. These movements mixed with indigenous traditions and the dances of working class European immigrants to form the precursors of modern-day Latin dance, from salsa to bachata (a dance form with roots in the Dominican Republic). In the 19th century port city of Buenos Aires, French, Italian, German and Spanish immigrants arrived in large numbers in search of better lives. People and cultures mingled, and out of that meeting came tango. “Some of the best tangos were composed by people who couldn’t write them nor read them,” said Jorge Luis Borges in a 1966 interview published in the literary journal, The Paris Review. The iconic Argentine writer and poet felt that these individuals who created the first tangos simply “had music in their souls”. The art form was intuitively built, translating across disparate cultural backgrounds. Waves of migration across the Atlantic only escalated with the economic shifts, war and political turmoil of the late 19th and early 20th centuries. Most of the famous Argentine tango composers and lyricists of the last century belonged to immigrant families, many of them Italian in origin. The bandoneon or concertina—key to tango music—has its roots in Germany. As the dance, its music and culture have evolved, they have accrued influences as far ranging as American jazz and the Viennese waltz. And now we listen to Afro-Caribbean-Spanish-Italian rhythms under Indian skies. Tango changes the dancer, but as we adapt the dance to individual forms of expression in new cultural landscapes, we change tango as well. There is bound to be a hint of India in the tango we dance. 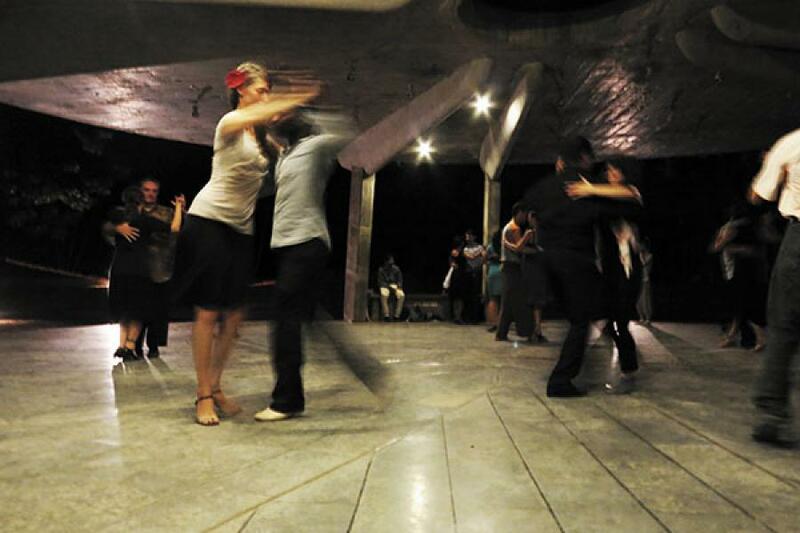 This year’s tango festivities in India spread out to landscapes far removed from Auroville, with Trozzola and Inglese taking the dance to Bangalore, Mumbai and Pune. As part of the Bangalore Tango Festival (now in its second year) from March 21 to March 23, the teachers give us another weekend of lessons. I sit to the side of the dance floor on CMH Road, Bangalore, resting my aching feet. I am not yet certain how to walk in high heels, but I am slowly learning to dance in them. Trozzola and Inglese pace the room, exhorting us to show more energy. (“Energia.” Little by little, we’re all learning Italian.) They tell us to feel the music and interpret it as we dance, to focus on expression. And then the two teachers dance, and the world stops. They become the music’s notes as they move. This pathos seems larger than the room, larger than all the transfixed figures within it. Emotion escapes from the seams of the music and the dancers’ embrace; it finds life and breath in each of us. In his poem ‘The Art of Poetry’, Borges says poetry can “convert the outrage of the years into a music”. Tango is a raw dance, at its best. It was bred by the dispossessed of the 19th and 20th centuries, as a vessel for their emotional tumult—pain and joy intertwined. There is no point seeking the perfect technique in this form. And yet, here we are back in Bangalore, moths to the flame, chasing perfection. Chasing tango’s elusive beauty. The venue for the evening of social dancing that ends the Bangalore Tango Festival is a futuristic glass-fronted restaurant called The Loft in Indiranagar’s 100 Feet Road. The design of the space seems a mix of log cabin and The Great Gatsby. The menu displays overpriced fusion: Unidentified berries and dabs of avocado decorate our pani puri. Into this strange world come dancers in evening attire, and music recorded by singers and players long dead. Bangalore is far removed from Buenos Aires, and yet there are commonalities. To write about the city today is to write about constant change, in a manner similar to Mumbai: Buildings torn down and remade, displaced people rebuilding their identities, a maelstrom of cultures. The city is a chaotic mess, but also a hotbed of creative vitality. Some of the restless souls that populate this place unleash their creativity in music and theatre, others in poetry or design. A few find tango. For others, tango finds them. The author of this article should have researched a little bit, she would have found plenty of tango in New Delhi and Mumbai. In fact New Delhi has been the hub of tango as far as India is concerned. Not only does it have the largest tango community, it has the most active social tango or. 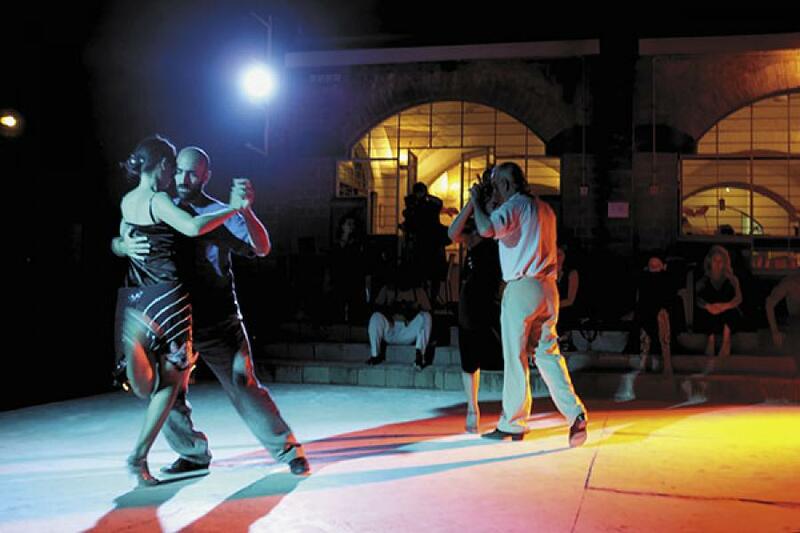 milonga circuit. New Delhi held the first international tango festival in India in November 2011. I have been conducting weeklyclasses since 2009 at Capitol Hotel Ashok, same day same time for the last 6 years. Over the last 4 years my school 2ToTango has organised workshops with more than 25 international teachers. O think it gives one some sense of the Tango scene in new Delhi.